Several new developments are paving the way toward introducing a mediation process into the Vietnamese legal system. In May, the Ministry of Justice set up a drafting committee to consider bringing in commercial mediation services in Vietnam. Nguyen Duc Chinh, Vice Minister of Justice, is the new head of the committee, comprised of 18 ministry officials. One month later, the ministry approved a draft decree making mediation legal at a grassroots level beginning on January 1st, 2014. I believe this is wonderful news for the Vietnamese legal system, Vietnamese lawyers, and the general public. 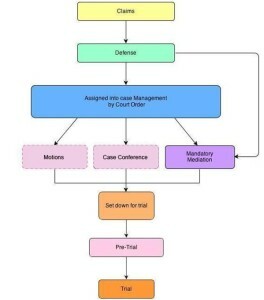 Mediation is an alternative and confidential method of resolving various types of disputes. A mediator’s goal is to find a practical solution to the conflict while maintaining neutrality. These recent events take me back to the time I was a lecturer of Alternative Dispute Resolution at York University in Toronto, Canada. It was 1996 and a group of lawyers, mediators, and educators, including myself, proposed a similar decree for the Canadian Justice System in my province of Ontario. We worked on a pilot project for one year, pro bono (for free), mediating commercial dispute cases and helping to relieve the backlog in the Ontario courts. I am applying similar pro bono initiatives to projects in Vietnam. For example, later this summer I am planning to train a group of business people, lawyers and law students from Vietnam National University on the concept of mediation. That way, they can also work pro bono to gain experience so they can initiate programs to resolve disputes and improve access to justice in marginalized communities throughout Vietnam. This and other projects are being carried out in collaboration with various non-profit organizations such as the World Mediation Organization. I will be speaking and submitting an academic paper on the results of my training at the 2nd Southeast Asia Pro Bono Conference and Workshop in Saigon on October 11th and 12th. So what are the advantages of mediation? 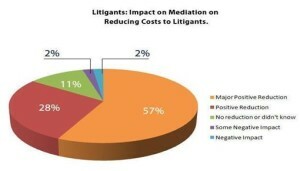 Put simply, mediation saves costs, time and also saves relationships. As well, mediation is less risky for opposing parties because they are not at the mercy of some judge or arbitrator. Nobody loses. A Canadian government report in 1997 analyzed more than 3,000 mediations under the pro bono mediation pilot project. Both litigants and lawyers reported these methods saved about $3,000 per case on average. Lawyers were also pleased because their cases were settled more rapidly, they were paid more quickly and increased their volume of cases. 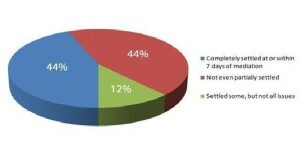 About 44% of mediated cases settled within seven days and well over half were eventually settled through the Mandatory Mediation Program. 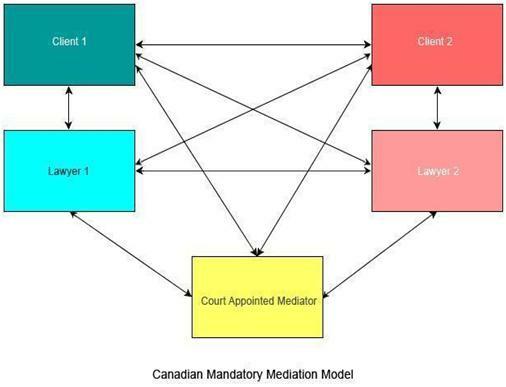 Mediation in Canada is now an integral part of the legal process as illustrated in the chart below. I believe that lawyers and their clients will benefit greatly when mediation is an option in Vietnam. A Win-Win solution will result when the litigants move away from adversarial positions and focus their energy on finding common solutions.